These Pet Rescue level 668 cheats and tips will help you beat level 668 of Pet Rescue. The objective of Pet Rescue level 668 is to rescue 12 pets and get 50,000 points in 50 moves. 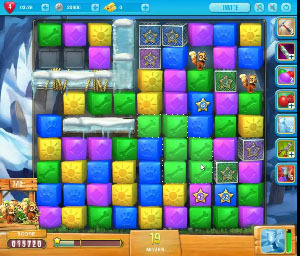 The middle row in Pet Rescue Saga Level 668 is almost completely filled or blocked off by locked blocks. There is only one opening that the blocks can fall down to the bottom of the board. You will need to make combinations to bring down one of the half line blasters to the last column on the left side of the board. Here you will be able to activate it to clear the key from the its glass block. Once you activate it, you will be able to free the blocks from their locks. Look to activate the half line blaster boosters that are scattered around the board. These boosters will point up, so look to drop them to the bottom of the board to clear more blocks. Also, you will be given the paintbrush booster. The paint brush booster will continue to fill up as you progress through the level. Paint the blocks to make larger combinations. A majority of the pets will fall down the right side of the board. Look to make combinations underneath the animals when you get the chance. Be aware, metal mesh crates will fall down as well. Since you do not have unlimited moves, do not focus on clearing these unless necessary.